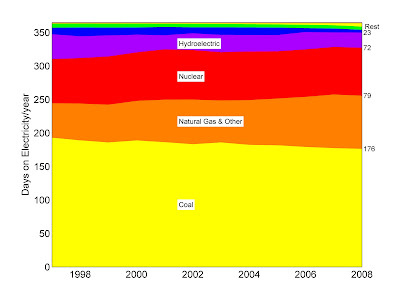 Similarly, in 2008, natural gas supplied 79 days of electricity, nuclear power 72 days, and hydropower 23 days. The electricity share of natural gas grew from 50 days per year a decade ago, to almost 80 days in 2008. No new nuclear reactors have been built in the U.S. since late 1970s, but the nuclear power industry has learned how to manage their reactors better, and their share of electricity generation has grown somewhat. The share of hydropower has decreased substantially over the last decade because of droughts and dam silting. Together, these four basic sources of primary energy delivered 350 days of electricity in 2008. The remaining 15 days of electricity were delivered by petroleum (4 days), biomass (5 days), wind turbines (5 days), geothermal steam generators (1 day), and photovoltaics/solar thermal concentrators (1 hour). To see the full size image, click on the image above. Electricity generation in the U.S. uses 37% of primary energy (heat generating energy), more than any other sector of the energy economy. In 2008, coal delivered 176 days of electricity; natural gas, 79 days; nuclear power, 72 days; hydropower, 23 days; and all remaining sources combined, 15 days. Overall, 70 % of electricity in the U.S. was generated from purely fossil fuel sources in 2008. Data source: DOE EIA, accessed 03/28/2010. 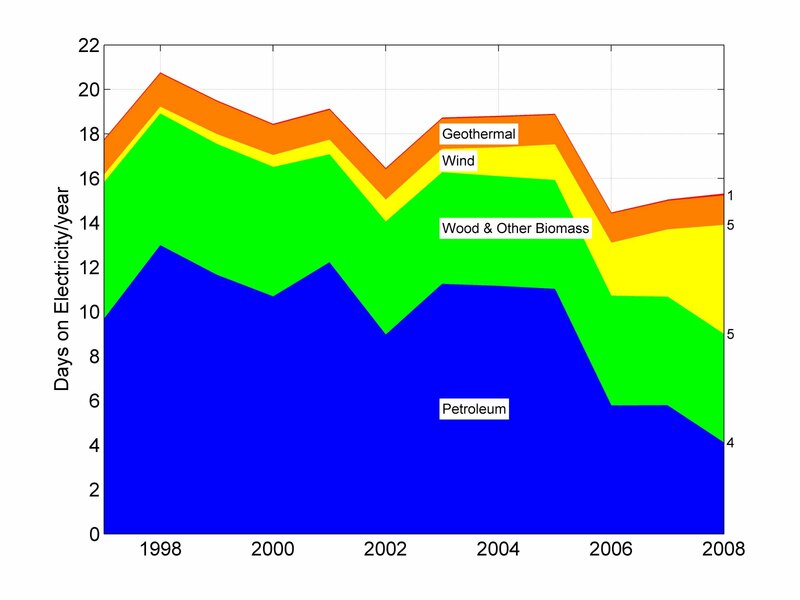 The remaining 15 days of electricity generation in the U.S. can be split as follows: In 2008, four days of electricity came from petroleum (essentially a single power plant in Honolulu, Hawaii); 5 days from biomass burning to cogenerate electricity from wood chips, agricultural residues, etc. ; 5 days from wind turbines, and growing fast, especially in Texas; 1 day from geothermal steam, mostly in California; and 1 hour from solar photovoltaics and solar thermal concentrators, also mostly in California. When someone tells you that electricity generation from photovoltaics doubles every year or so, please understand its tragically negligible significance. Data source: DOE EIA, accessed 03/28/2010. The transportation sector is totally dominated by petroleum, as shown below, assurances to the contrary from the Renewable Fuels Association notwithstanding. Our freedom from petroleum-based liquid transportation fuels currently lasts for only one week per year and perhaps two weeks in the future. In 2008, automotive gasoline provided 202 days of all transportation needs in the U.S., diesel fuel 100 days and jet fuel 38 days. Residual or bunker oil used to be burned in electrical power stations up until 1985, but now it powers ships almost exclusively. Ethanol sufficed to power transportation in the U.S. for 8 days in 2008, and ethanol production itself requires a significant amount of fossil fuels. The message is clear: The only way out of the total dependence on petroleum-based liquid transportation fuels is to electrify railroads, and move goods and people across the U.S. using electricity. Currently, there are no other choices, unless one prefers to be deluded by biofuels or a "hydrogen economy." Consumption of liquid transportation fuels in the U.S. uses 31% of primary energy (heat generating energy), and is the second largest sector of the energy economy. 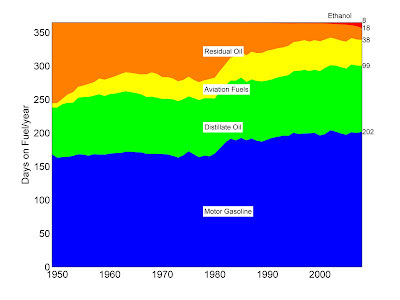 In 2008, automotive gasoline delivered 202 days of transportation; distillate oil (mostly diesel fuel), 99 days; aviation jet fuel, 38 days; residual oil, 18 days (now used almost exclusively to power ships); and ethanol, 8 days. When someone tells you that driving your car on ethanol will make the U.S. energy-secure, laugh, because fossil fuels provide 98% of energy used to power U.S. transportation. Oil shortages caused by the peaking global oil production will cause disproportionate disruptions in transportation, but none in electricity supply. This is the reason why a crash program in railroad electrification would benefit the U.S. enormously. Data source: DOE EIA, accessed 03/28/2010. I hope that now you understand my concern with so many cooks and drivers in the U.S. publicly flaunting their ignorance as "energy experts." What is it about energy, this divine source of almost everything in a modern society, that makes people say so many innate and emotional things? Because they have barbecued? P.S. Please check out the 1,000 juicy comments to that WSJ editorial. Did you notice that this energy commentariat consists mostly of men? Are they trying to suggest that "my energy is bigger than yours?" If not, why are they so angry? Great analysis. Thanks for sharing your thoughts on energy. Rare that a chem e takes time to post for general consumption. Informed views like yours are valuable.